We had a family birthday at our house the other day. My baby boy turned 20! I know every parent says this but…where did the years go?? So this week, as his birthday approached, I asked as I always do, what he’d like to do for his birthday dinner—go out to a restaurant with us or with his friends, or have dinner at home. It’s exam week for him so, as usual, he opted for the home dinner. 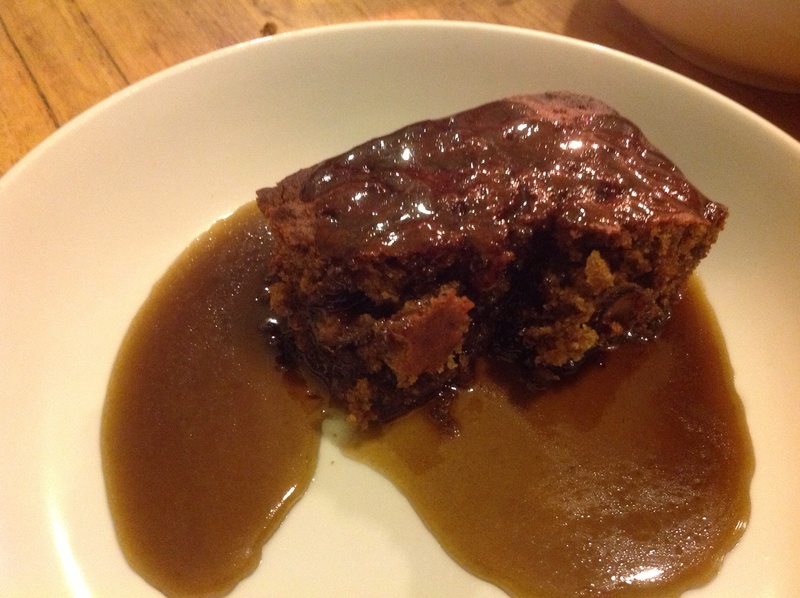 And as usual he chose the dinner he always chooses when he gets the chance—spaghetti with bean bolognaise sauce, and this time he chose sticky date pudding for dessert. Chop the onion, garlic, celery and carrot finely and saute until they start to soften. Add the stock and mix it up, bring to a simmer, then cover and cook for about 20 minutes, checking it every few minutes to make sure it isn’t sticking to the bottom of the pan. (It can burn pretty quickly). Try not to leave the lid off because it reduces quickly and gets too thick to be a sauce. Now, mash it up with a potato masher, but not too thoroughly, just to break up the beans a bit. Serve on cooked pasta, or use in any recipe that calls for a meat sauce. 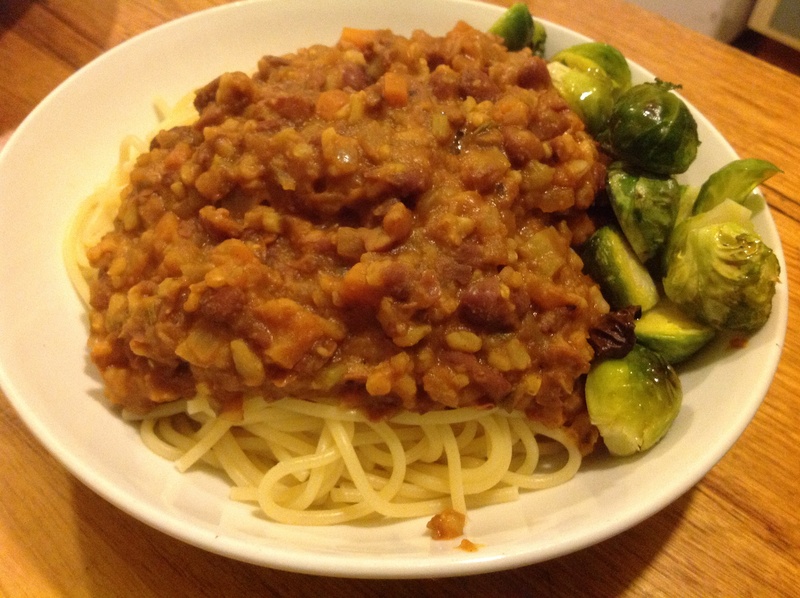 This time, I served it with Brussels sprouts, because they’re my son’s favourite vegetable. 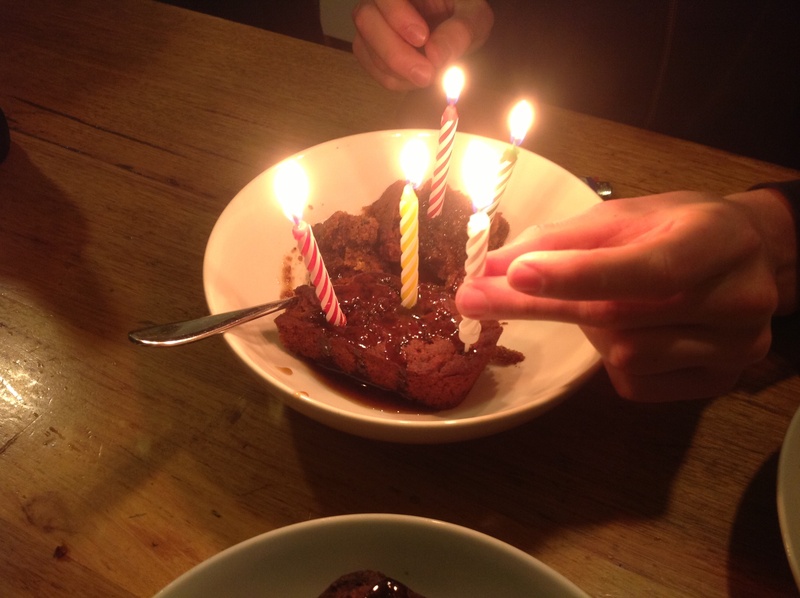 Sticky date pudding was interesting for me this year. I’ve always used the same recipe, and that included butter and cream, so I tracked down a vegan version. It was delicious—in fact the family all said they liked it better than the old recipe. I found it a little too sweet (which is really saying something because I have a very sweet tooth! ), but I have to admit, it probably only made me sick because I ate too much of it! Well, next year’s the BIG 21st birthday. I wonder if he’ll be choosing bean bolognaise AGAIN??? I was going to include a video of Happy Birthday right here, but with the current copyright battle underway I think I’ll just leave it at that. Anyway, you know how it goes! Hi Johanna. There weren’t that many family vego cookbooks back then- not that I saw anyway (apart from Rose Elliot’s, which were a bit of a saviour for me). I find it funny in the Helen Stephens book when she mentions garlic as being something a bit odd and adventurous that kids might not like. Times have certainly changed!